You may be wondering if we posted this photo the right way up and if so what exactly is it…!! Well, for our Get it Clean team, it was what they were looking at when they arrived on the job…a narrow light shaft in a commercial multi-storey building. Not an ideal worksite for a claustrophobic! Thankfully given our state-of-the art equipment what looks like a challenge was in fact easily achievable. Using light-weight telescopic poles the team were able to reach the glass panes in this high narrow space with ease. This is just one of many commercial building complexes that we look after. 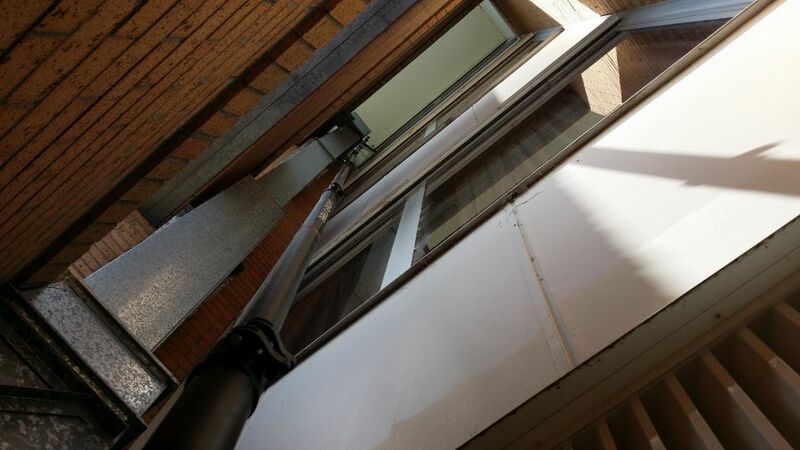 Body corporates and property managers in and around Brisbane are entrusting us with their window cleaning, building wash downs and high pressure cleaning of common areas. The results speak for themselves and the reviews on our website do too…be sure to check them out! If you want to know what we can do to help with the external cleaning of your building, give us a call and we will happily meet you on site to discuss your needs and how we can help.